Glorishears of Brummagem started in 1978, with seven would-be dancers practising at the Bull’s Head, Bishopsgate, Birmingham. 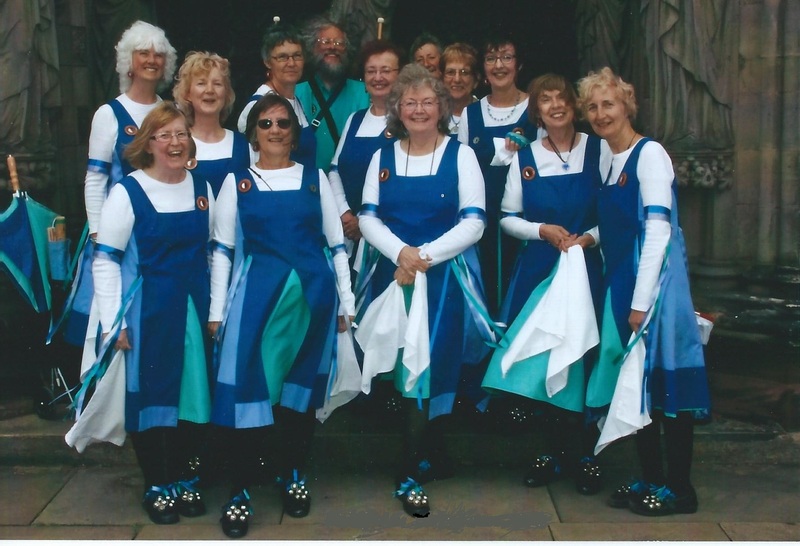 They had met previously at local Folk Festivals, and came up with the idea of forming their own women’s Morris side. Glorishears is the name of a Cotswold hankie dance, and Brummagem is an old colloquial name for Birmingham. 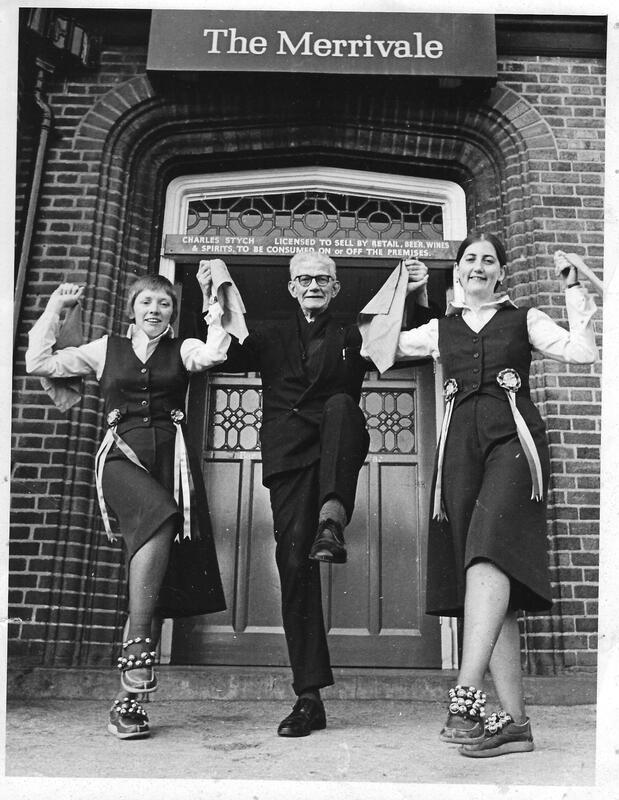 Their first public appearance was in 1979 when they danced at several pubs wearing their newly designed kit of crimplene culottes, and a waistcoat decorated with the distinctive heraldic roundel representing Birmingham’s industries. 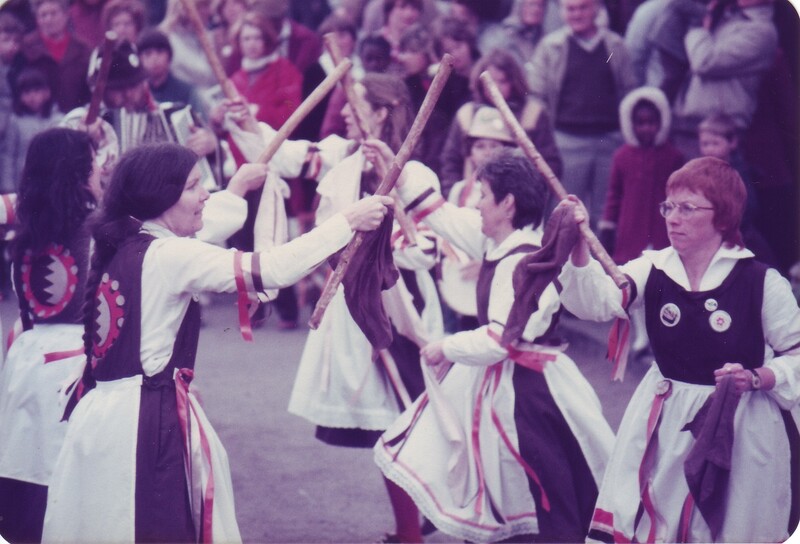 In 1981 Glorishears joined the Women’s Morris Federation. In 1983 the kit was revised becoming a brown pinafore with white aprons. Glorishears of Brummagem hosted the Morris Federation AGM in Birmingham city centre in 1986, one of the biggest events of its kind to be held in the Midlands. In 2001 Glorishears successfully bid for a lottery ‘Awards for All’ grant. We ran a competition in partnership with the UCE to design and make a new kit, to be based on tradition but to meet the needs of the twenty-first century. The new blue and green kit was launched in 2002. In the winter Glorishears of Brummagem sometimes appear as Brummie Gems Molly dancers and they also perform a Mummers play. We practise on Sundays at St. John’s Church Hall, Church Road, Perry Barr, Birmingham, B42 2LB 7pm-9pm. New dancers and musicians are always welcome.